BTS Master MT8222A is the value choice for deploying, maintaining and troubleshooting 2G/2.5G, 3G, and 4G wireless base stations. The BTS Master is a combination of our popular Spectrum Master MS2721B and VNA Master MS2024A offered as one handheld solution, weighing 4 kg (9 lbs). The new BTS Master is an integrated multi functional base station test tool eliminating the need to carry and learn multiple test sets. 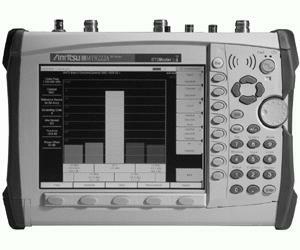 The MT8222A measurement capabilities include spectrum analysis including smart measurements, precision return loss, VSWR, cable loss, distance-to-fault, two port gain/loss, one port and two port magnitude and phase, interference analysis, spectrogram, RF and demodulation measurements for WCDMA/HSDPA, GSM/GPRS/EDGE, CDMA, EVDO, TD-SCDMA, Fixed WiMAX and Mobile WiMAX, demodulating WCDMA/HSDPA, CDMA, TD-SCDMA, EVDO over the air (OTA), location information, enhanced frequency reference oscillator accuracy, variable bias tee, 2 Mb/s - E1, T3 and T1 measurements. The High Accuracy Power Meter (Option 19) provides true RMS measurements from 50 MHz to 6 GHz. The BTS Master can be configured with an interference analyzer, which is maximized by the MT8222A’s built-in low-noise preamplifier. The result is that interfering signals down to -162 dBm can be identified and located, allowing technicians/RF engineers to better address quality issues that affect user service. Interfering signals can be identified using the Spectrogram display. Master Software Tools (MST), comprehensive data management and analysis software is user friendly and it is easy to manage, archive and analyze system performance, trends and the general health of monitored base stations. The MT8222A is shipped with a User''s Guide, a soft carrying case, an AC - DC Adapter, an Automotive Cigarette Lighter/12 Volt DC Adapter, a CD ROM containing Master Software Tools and USB driver, a USB A-mini B cable, an Ethernet Cable, a rechargeable Li-ion battery pack, a 2 GB Compact Flash module, a type-N male to SMA female adapter, a type-N male to BNC female adapter. Every MT8222A has a one year warranty for parts and labor and is shipped with a certificate of calibration and conformance.